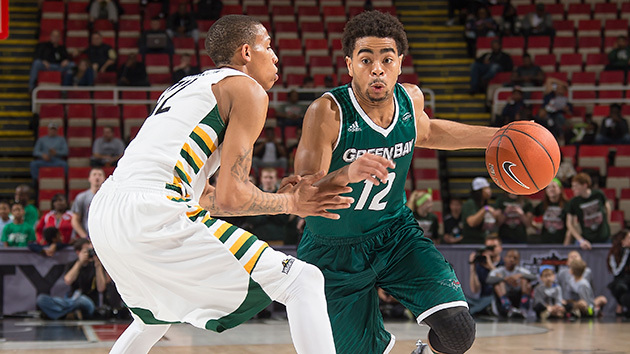 Everything you need to know about the Green Bay Phoenix as they begin the NCAA tournament. The Case For: The Phoenix were inconsistent through much of conference play; they alternated wins and losses in every game between Jan. 7 and Feb. 15. But first-year coach Linc Darner’s team hit its stride during the closing stretch of the regular season, vanquishing four league opponents in a row (Milwaukee, Youngstown State, Cleveland State, Illinois Chicago) before falling to regular-season league champion Valparaiso, one of the nation’s top mid-majors. The Phoenix avenged their loss to the Crusaders when it mattered, in the semifinals of the Horizon League tournament, before downing Wright State in the final to earn their first tourney berth in 20 years. Green Bay plays fast—really fast. It’s average possession length of 13.4 seconds is the shortest in the nation, and nearly a fourth of its offense comes in transition, per Synergy Sports. The Phoenix can fly up and down the court because they’re careful with the ball, finishing 27th nationally in turnover percentage. Meanwhile, Love, a first-team All-Horizon selection, does a good job swiping ball away from opponents. He led the Horizon in steal percentage during conference play. This isn’t a one-man show, though. Senior forward Jordan Fouse recorded 41 points and 17 rebounds combined in the aforementioned wins over Valparaiso and Wright State. The Case Against: The last two Green Bay teams, both of which fell in the Horizon tournament, were stronger than the one that’s going dancing this year. One major difference from last season is that the Phoenix have fallen from 17th nationally in adjusted defensive efficiency to 168th. The Phoenix may excel at forcing turnovers, but they don’t force very many misses: Opponents shot 49.5% inside the arc against Green Bay this season, good for 211th in the country. What’s more, when opponents do miss, there’s a good chance they’ll get another shot. The Phoenix allow teams to grab 31.8% of available offensive rebounds, which ranks 277th nationally. Green Bay’s shaky defense and rebounding wouldn’t be so troubling if it was scorching nets on the other end of the floor. But it’s not: This season the Phoenix have connected on fewer than half of their twos, 35% of their threes and 65.7% of their tries from the free-throw line, ranking 176th, 159th, 317th, respectively. And while Love and Fouse are a strong inside-out duo, they aren’t as potent as the tandem (guard Keifer Sykes and center Alec Brown) that propelled the Phoenix to the bubble in 2014. SI Prediction: Lose to Texas A&M in the first round.